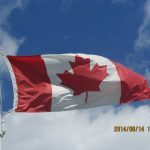 Dr. John Percival McKinnon was born on the 23rd of July, 1872 in Erin Twp, Wellington County. His parents, Malcolm McKinnon and the former Mary Thomson were farmers. Dr. McKinnon was the 2nd of 8 children and his siblings were; Herbert, Wilfred, Chester, Edgar, Daniel, Mary Ella and Archibald. Prior to going to medical school, Dr. McKinnon was a teacher at the Orangeville High School for 6 years. Dr. McKinnon graduated M.B. 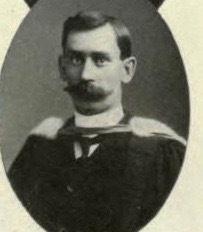 in 1904 from The University of Toronto Faculty of Medicine. After completing his internship, Dr. McKinnon practiced medicine in Wheatley. 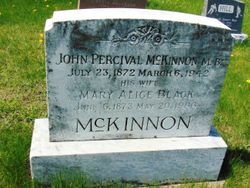 Dr. McKinnon married Mary Alice Black on the 4th of July, 1906 in Eramosa Twp, Wellington County. Mrs. McKinnon was born on the 7th of June, 1873, the daughter of Hugh Black and the former Susan Pearen. Her father died in 1909 and on his death record, his occupation was listed as postmaster. At the time of her wedding, Mrs. McKinnon was a postal clerk. She was the 4th of 7 children and her siblings were; Norris, Lois, Herbert, James, George and Albert. After their marriage Dr. and Mrs. McKinnon resided in Peel Twp in Wellington County and by 1921, they resided at 109 Norfolk Street in Guelph. Dr. McKinnon died on the 6th of March, 1942 while living in Guelph. Mrs. McKinnon died on the 20th of May, 1966. They were buried at the Everton Cemetery in Wellington County. *His younger brother Dr. Archibald McKinnon served during World War I and he also became a physician. Dr. Archibald McKinnon specialized in psychiatry and practiced at the Homewood Sanitarium in Guelph.